Our expert technical sales staff can help you to identify the part that you need for your products. We are available Monday to Friday via phone call, sms, whatsapp or email request. Whether you need critical parts like fuser assemblies, formatters, dc contollers, scanner assemblies, AC adapters, memory, printer maintenance kits, or more hard-to-find parts like gears, scanner cables, display control panels, solenoids, pickup rollers, separation pads, trays, plastic parts and assemblies, we have a complete parts inventory to meet your needs ! 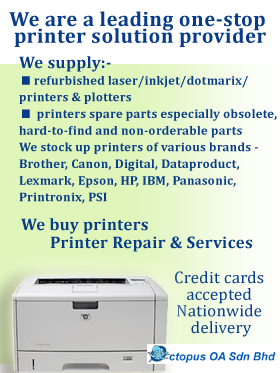 For printer parts that you may wish to order but not listed here, please contact us.